Are X-ray and radiation gloves available in sterile gloves or only as non-sterile gloves? There are sterile X-ray and radiation gloves available that provide a high level of protection from scattered radiation exposure. These gloves are often used in very specific procedures such as angiocardiography, heart catheterizations, orthopedic surgery, anesthesiology, and other very specialized areas. The sterile gloves are typically latex and may come in powder or powder free options. 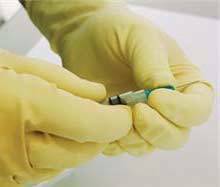 In most cases the gloves are lead free and have a synthetic polymer exterior coating that provides grip with even the smallest medical equipment. Since these gloves, both sterile and non-sterile, are heavier than other surgical gloves they are often designed to be curved through the fingers, providing a natural position for the fingers even with long duration wear. There is also the possibility of having both reusable and disposable lead gloves or X-ray and radiation gloves that are lead free. Depending on the type of use either option can be the right choice for your specific needs. When are lead gloves used and are they required in all X-ray and radiation use? Full protection lead gloves are not typically required in most procedures however, when direct exposure to the X-ray or radiation is possible they the most protective choice. Other gloves such as radiation attenuation gloves or radiation reduction or resistant gloves are ideal for scatter radiation as well as direct radiation exposure, depending on the specifications of the glove itself. Full protection lead gloves are usually sold as either the right or left glove while other types of radiation gloves are sold as pairs. How easy is it to move the hands when wearing X-ray and radiation gloves? Although a lot of the ease of movement depends on the particular glove style, greater advances in polymers and radiation reduction and resistance has lead to some very lightweight, highly flexible types of gloves. Lead free gloves tend to be much more flexible and light, with most at or under 0.007th of an inch in thickness. They also can be made with textured grips for easy handling of equipment during surgical or X-ray procedures. Finding the right size of gloves is an important feature. Many of these gloves are designed to be worn over other surgical gloves, a procedure known as double gloving. Not only does this provide additional protection but also comfort and ease of putting on the exterior X-ray and radiation gloves. Molded rubber lead gloves are the least flexible and tend to be bulky and relatively challenging to work with in handling smaller objects and equipment. These types of gloves are typically used in research and laboratory work rather than specifically in patient care and surgical applications. Lead mittens are the least flexible of the X-ray and radiation gloves on the market and are typically sold in a standard one size glove. These are longer through the arm than standard lead gloves and are 0.5mm in thickness, providing significant levels of protection.